Race car drivers can be inspirational. They become legends because of the way they inspired others in various ways. Mario Andretti influenced a generation of enthusiasts through the combination of his personality and his work on the track. You loved him, enjoyed the way he embraces everyone around him, and go on to win the 1969 Indianapolis 500 and the 1978 Formula One Driver’s Championship. And, yet, he has become a lexicon in our society as a race car hero – even still at age 78. Ayrton Senna holds the same kind of cache and influence for the 1980s generation worldwide. He yielded three Formula One Driver’s Championships as one of the riskiest, most aggressive, and masterful drivers of his era. Twenty-five years after his death at Monza, Senna’s name and legend has become the motivation for everyone who has competed in open-wheel racing since. Alex Zanardi has become an influence upon us. Not because of his work on the track. It is because of what he has done since that fateful moment in September of 2001 when the Italian driver met fate upon a nasty impact of his car on the EuroSpeedway Lausitz. To save his life, he had to have both legs amputated. Yet, what transpired after the double amputation was the stuff of inspiration for all of us. One thing that kept Zanardi going after the crash was his competitive spirit. As we witnessed since 2001, he has won two Gold Medals in the 2012 Paralympic Games in London as a handcyclist. Zanardi would repeat this feat in the 2016 Paralympic Games in Rio de Janeiro. He has also won his share of marathons and an additional ten world championships in handcycling. While he was finding a new spirit in Paralympic sport, Zanardi’s first love is motorsport. He made his mark as a two-time CART driver champion – years before it became IndyCar. The late 1990s saw Zanardi as a driver destined for greatness. He was invincible. After 2001, Zanardi began to drive with the help of hand controls replacing what his feet could do exceptionally well. In Europe, Zanardi had plenty of successes in touring cars in a few series. However, he was determined to get back onto a larger stage. BMW Motorsport gave Zanardi a shot in their M4 last year on the DTM circuit. This marked a heralded “comeback” that would lead him to this weekend’s Rolex 24 at Daytona. Maybe it is played out this way because we have not seen Zanardi race in this country since the 2001 CART season. The exact date was August 19, 2001 at Road America. Yet, Zanardi’s run in the Rolex 24 at Daytona felt very special. 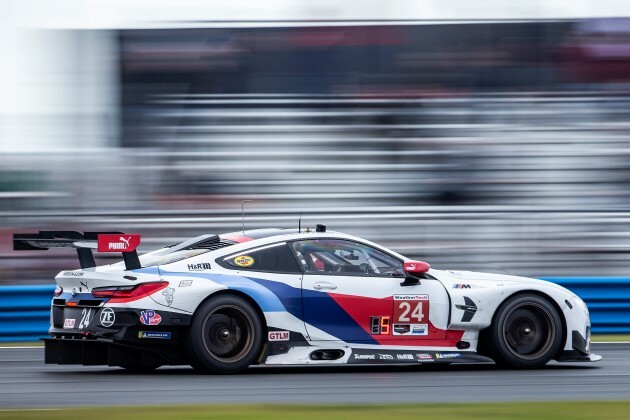 It is not because of he is running in the new BMW M8 GTE running in the GTLM class. 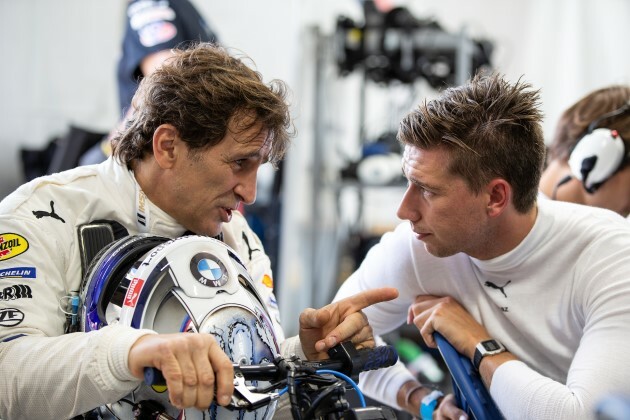 It is because he has garnered a lot of press Zanardi has received that has given a brighter spotlight on this particular running of the 24-hour endurance race at the Daytona International Speedway. He is not alone in this year’s motorsport and IMSA opener for 2019. Daytona has always welcomed the biggest stars in auto racing. This weekend bore witness to stints behind the wheel across all classes by the likes of Juan Pablo Montoya, Christian Fittipaldi, Simon Pagenaud, Alexander Rossi, Helio Castroneves, Rubens Barrichello, Sebastien Bourdais, Scott Dixon, AJ Allmendinger, and Fernando Alonso. These are just a few of a roster of great drivers taking on Daytona’s superspeedway with its series of infield twists. While these racing stars shined under the lights overnight, all eyes have been fixed on the number 24 BMW M8 GTE. They want to know when Zanardi will get another stint behind the wheel. While Zanardi captures our imagination, we have a season of great motorsports ahead. IndyCar will be graced with a full season of Alonso behind the wheel of the McLaren-Chevrolet. As the Spaniard knows very well from his run at the 2017 Indianapolis 500, IndyCar has a great selection of drivers that will make his run to the championship a very hard climb. Celebrating its 50th anniversary, IMSA should also be entertaining with a more competitive DPi class between Acura, Cadillac, Mazda, and Nissan engines powering a new generation of prototypes. I always point to the GTLM series as the most competitive every year. BMW always have a tough fight on their hands against the Ford, Corvette, Porsche, and Risi Competizione Ferrari teams. If you watch any IMSA races, pay attention to the sports car classes. I could go on and talk about Formula One and NASCAR. However, there are many concerns on whether either circuit could yield anything interesting for us to even discuss on this site. So, IndyCar and IMSA it is! And, of course our friends Braunschweig Racing in the World Racing League and SpazRacing running at a Gridlife nearest you. What do you think about how this motorsport season will play out? Are you celebrating Zanardi’s return to racing in the USA? Or, do you think Alonso will become an IndyCar champion? Fasten your seatbelts, everyone! This is going to be a fun year on the track!